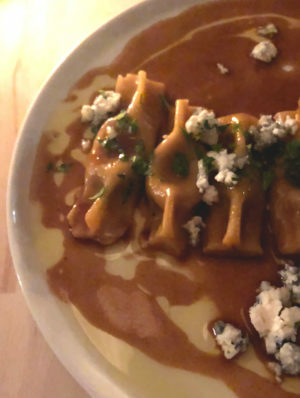 Once a week during the quiet season, Trixie’s Chef Ryan Klawitter looks forward to spending a whole night cooking one of his favorite foods: pasta. The weekly tradition of Monday Pasta Night at Trixie’s in Ephraim means the standard menu is shifted into a noodle-heavy version, with weekly variances based on ingredient availability and the creativity of the kitchen. On a damp, gray Monday, my husband and I made a reservation to get our pasta fix. The intimate dining room was warm and welcoming, and perfectly placed candles made the whole space glow. Our server presented the freshly printed menus and highlighted the evening’s entree options, including a few new additions that immediately stood out as must-trys. 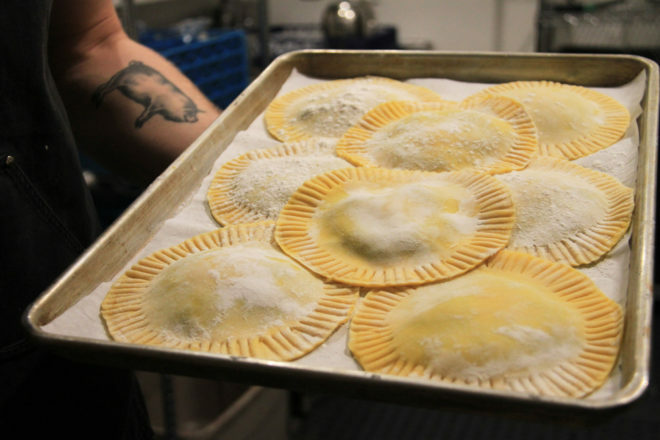 We began with scarpinocc, an appetizer-sized plate featuring small, crescent-shaped ravioli. It caught my eye since it featured both truffles and bleu cheese, both of which I adore. The filling inside the noodles was a cauliflower and truffle mixture, which was subtle but noticeable. The beef red wine au jus added a meatier taste, and the bleu cheese was a creamy, bold addition to each bite. All of the pasta at Trixie’s is made from scratch in house, giving it a distinct texture. The prep for the evening begins with the meticulous creation of each batch of pasta variety, with each noodle requiring a particular shaping method. The scarpinocc is folded and pinched shut, the pappardelle is cut into thick ribbons, and the black pepper-infused spaghetti is cut and weighed to ensure even portion sizes. 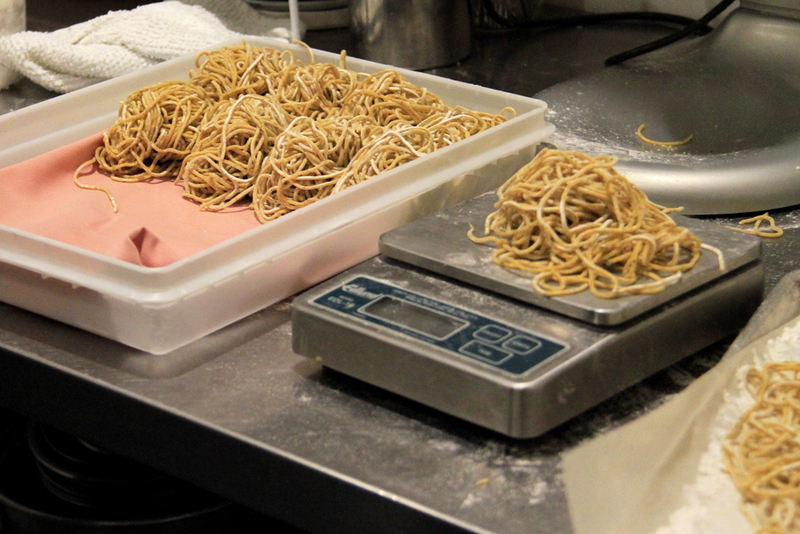 It’s an impressive amount of pasta preparation, with special care put into each dish. For entrées, we ordered the gnocchi and beef tongue bolognese, which were most similar to a traditional entrée portion. 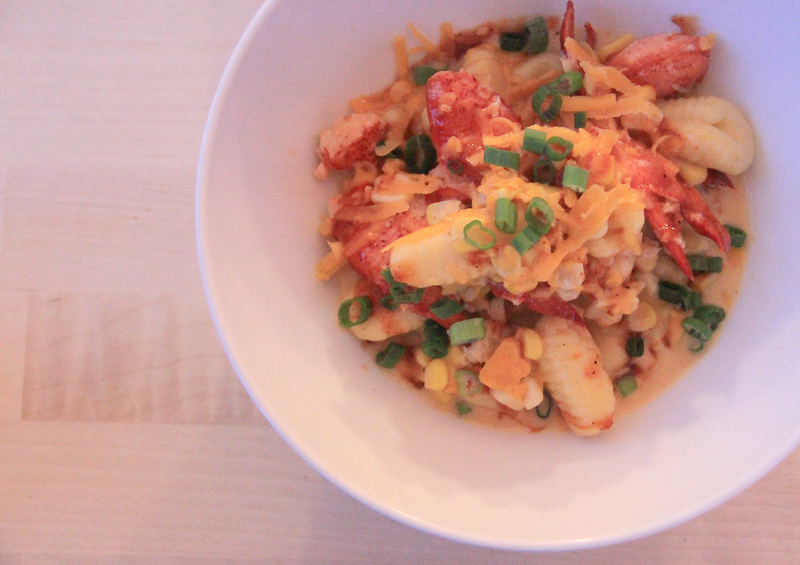 The gnocchi was served in a large pasta bowl and presented ever-so-beautifully as a mound of soft, pillowy gnocchi with bright red fresh lobster meat, corn kernels, Hook’s 10-year aged cheddar and chopped scallions. Everything was covered in a creamy chili sauce that I seriously considered sipping from the bowl’s edge to get to the last few spoonfuls. The beef tongue bolognese was described by my husband as “the perfect dish to fulfill a rich, Italian pasta craving,” and indeed he was accurate. The meat sauce was thick and heavily flavored with Italian herbs and spices. There was plenty of beef in each bite to accent the tomato base and a dusting of SarVecchio and fresh herbs added to the classic Italian flavors. We split a third entrée dish, the raviolo, which turned out to be our favorite item of the night. It’s name alone entertained us, as we discovered it was named so due to it being a singular ravioli. The presentation was also unique: The large, round raviolo was served centered in a bowl atop puréed squash. Cutting into it, the filling of egg, feta and spinach was reminiscent of spanakopita, which worked amazingly well with the slightly sweet squash. The elements of sweet, savory and salty were intriguing and made for a unique and memorable dish. We left the dinner fully sated, but not in a way that is often associated with those pasta-heavy, pre-marathon meals. The fresh pasta produced a lighter texture and portion sizes were not too heavy, allowing us to enjoy the variety and blend of the different ingredients. Bravo! Interested in partaking in your own pasta-filled evening? There are only a few more chances to attend a Monday pasta night at Trixie’s before the restaurant closes for the season after Valentine’s Day. Reservations are highly recommended and can be placed through the online reservation system at trixiesfoodandwine.com or you can hope to find an opening with the first come, first served seats at the bar.